The following items can be purchased by PayPal at paypal.me/BrockBeard or by check or money order mailed to Brock Beard, 3240 Lone Tree Way, Suite 101, Antioch, California 94509-5559. All prices include cost of shipping to the U.S. For international orders, please contact me by e-mail at brockbeard@gmail.com. (1) White FlexFit LASTCAR.info cap like the one I wear at the races. 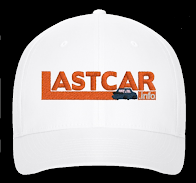 Hat proudly displays the LASTCAR.info logo in red. Add up to two lines of custom text at no extra cost. All designs will be previewed with purchaser for approval before ordering. Orders filled by VistaPrint. 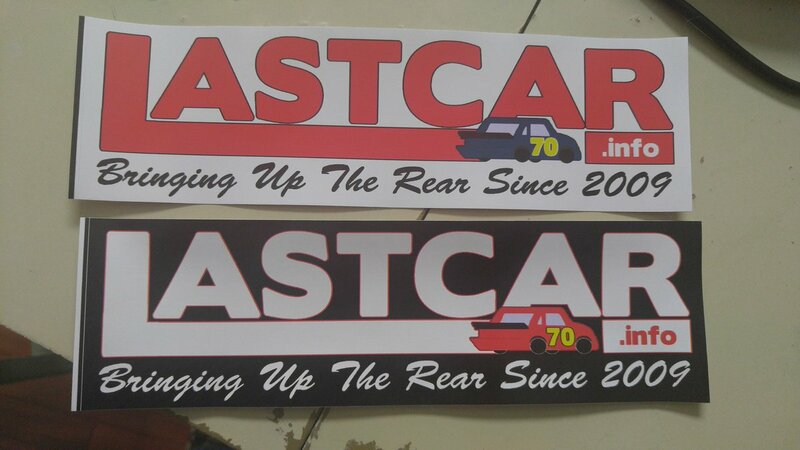 (2) LASTCAR.info Bumper Stickers. Printed in vinyl, standard bumper sticker size 3" x 10." Available in black with white text or white with red text. Orders filled by BuildASign. (3) "J.D. 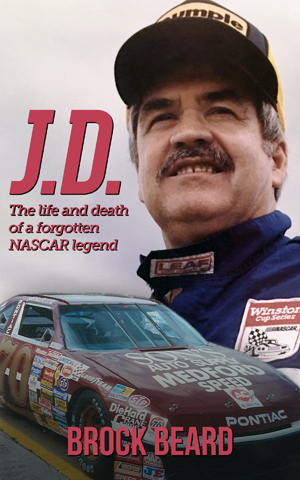 : The Life and Death of a Forgotten NASCAR Legend." Paperback published by Waldorf Publishing. Autographed and personalized by the author at no extra cost. Limited quantities available. For eBook and audiobook formats, plus other retailers where it can be found, click here. These other items may be ordered directly from other online retailers. Shipping information can be found on each respective website. Links provided in the pricing. 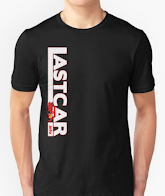 (4) LASTCAR.info T-Shirts, apparel, and notebook stickers. Available on RedBubble.com. 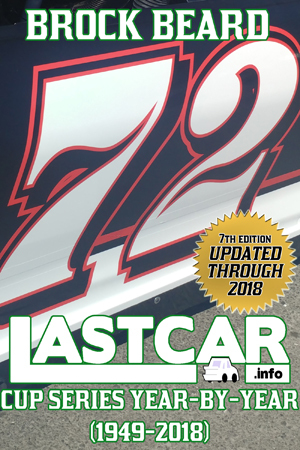 (5) LASTCAR.info Cup Series Year-By-Year (eBook only). 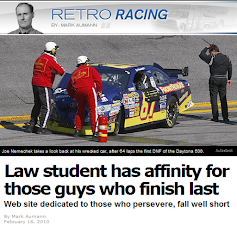 Contains year-by-year Cup Series last-place statistics from 1949 to present. Includes free yearly updates. 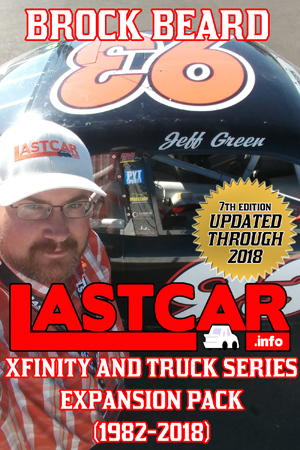 (6) LASTCAR.info XFINITY and Truck Series Expansion Pack (eBook only). Contains year-by-year XFINITY and Truck Series statistics from 1982 to present. Includes free yearly updates. (7) LASTCAR.info's Formulast One (eBook only). Contains year-by-year last-place statistics from Formula One from 1950 to present. Includes free yearly updates. 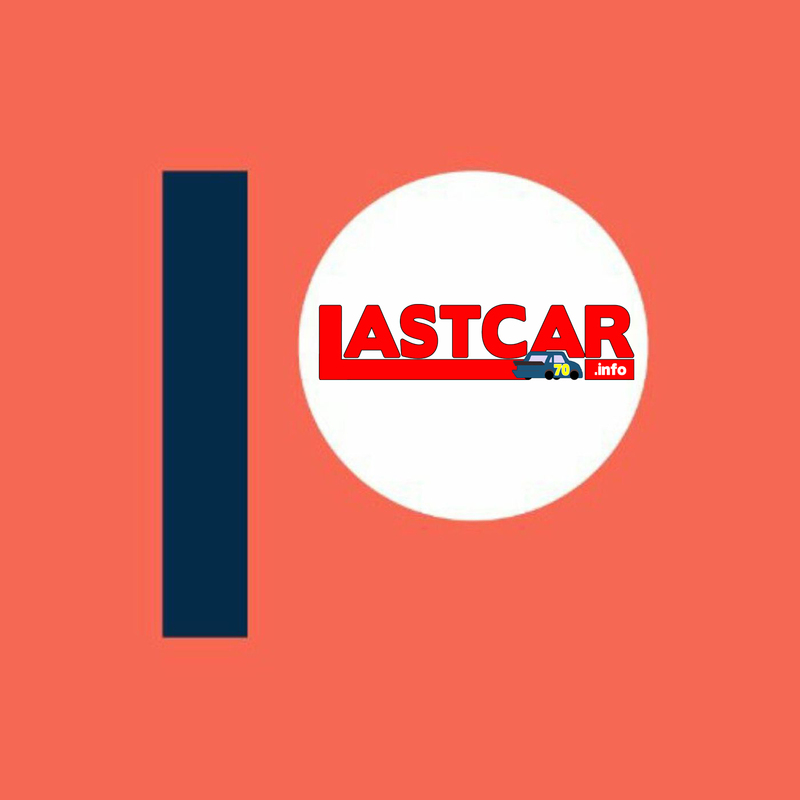 (8) LASTCAR.info Track Guide (eBook only). 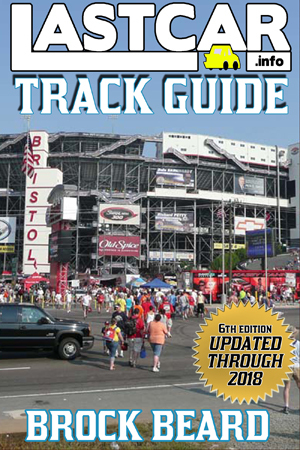 Contains track-by-track last-place statistics for the Cup Series. Includes free yearly updates.